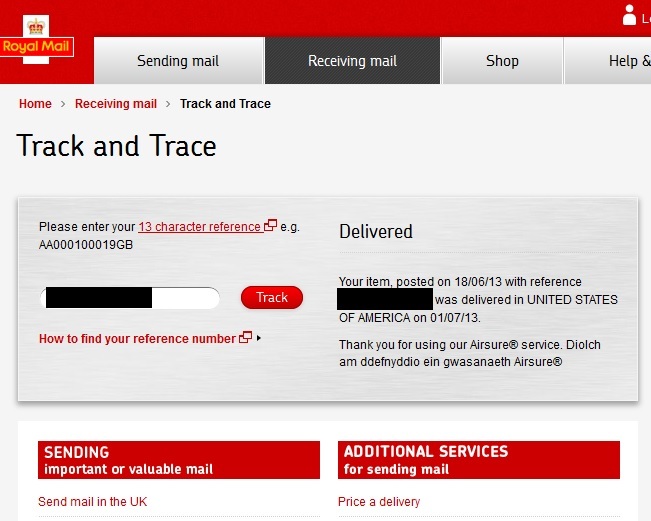 So, when you send a parcel via Airsure (the Royal Mail's trackable Airmail service) you get a reference number for tracking the parcel. You enter the number on the Royal Mail's own website and it tells you that it's entered the system... then that it's left the country... then that it's been handed over to the destination country... and then nothing until the item is delivered. 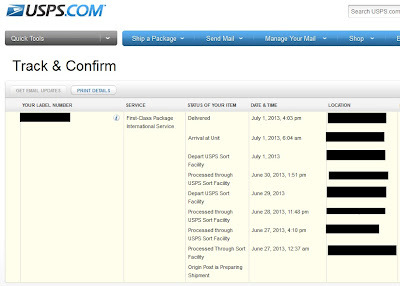 I often send parcels to the USA and they sometimes take 3-4 weeks to arrive. For weeks the only information I'll get out of the Royal Mail's website is that "your parcel has been passed to the overseas postal service for delivery in UNITED STATES OF AMERICA"... which isn't especially helpful information, especially if you've got an anxious customer worried about their order going "missing", or if you've sent something important that you really don't want to get lost. But! It turns out that if you go to USPS.com and enter the same tracking number the Royal Mail gave you, you can access much more detailed tracking information as the package travels through the USA! If you click on the image to see it full size you'll see just how much info you get throughout the parcel's journey - once it's cleared customs you're given the zip code at each step of the parcel's travels. So instead of replying to a worried customer saying "it's in your country somewhere!" you can say "it arrived in your State yesterday!" Isn't that great? I haven't tested it myself, but apparently this also works with other countries you can send Airsure parcels to (so you can just Google their postal service's websites and give it a try). You can also track parcels using this useful website that pulls tracking info from lots of different postal services, allowing you to track a parcel throughout its whole journey all on one site. I found this post really useful, I'm definitely going to bookmark this info... I might even do a blog post myself, of course I'd link back to here if that's ok? We have been using Royal Mail's Airsure service for 7-8 years to send letters (with money) and parcels to our children and grandchildren in Canada. We just key the tracking number into Canada Post's website and get all the detailed tracking info !! All our mail used to get there in 5-7 days. However this month we have found that Post Office / Royal Mail have abandoned the Airsure service and replaced it with Royal Mail's "International Standard", "International Tracked", International Signed" and "International Tracked & Signed" services. We used the Tracked & signed service and I can tell you it's rubbish !!! We posted a letter (with money) on 5/4/14 and for 11 days all we could find out is that it had left for Vancouver on 9/4/14 !! Canada Post website had no record of the tracking number. Today it has suddenly appeared on Canada Post's website to say it had been received in Winnipeg on 16/4/14 and expected delivery date is 23/4/14 !!! It should have gone Vancouver - Calgary - Cremona as it always used to. Now for some reason it has been sent another 800 miles further to Winnipeg !!!??? 18 days to get a letter to Canada on a special Track & Sign service - I don't think so !! Could have sent it by normal Air Mail quicker !! I'm afraid you're all going to have to start using a courier service, which is what we are now investigating for future parcels.